Regularly getting a good night’s sleep is so important for good health that it was added as an indicator to the American Fitness Index last year. 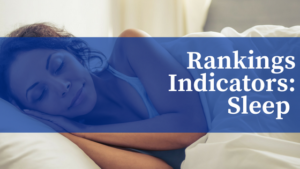 The 2018 American Fitness Index Rankings will also list “percent getting seven or more hours of sleep per day” as one of the personal health indicators that are used to calculate the final rankings. The source of data for this indicator is the CDC’s Behavior Risk Factor Surveillance System (BRFSS) national telephone survey. As you might imagine, the telephone survey methods used are very rigorous to make sure the results are as accurate as possible. Consequently, many medical and public health researchers rely heavily on the BRFSS for their work. Learn more about the BRFSS national survey on the CDC website. A question on the national survey asks, “On average, how many hours of sleep do you get in a 24-hour period?” As an answer, responders give a number – like six and a half or eight. Generally, experts believe at least seven hours of sleep per day are needed to stay healthy, so this is the measure used for the indicator. In calculating the Fitness Index scores, each indicator is given a weight from one to three to match how important each indicator is for fitness. Our national experts agreed that getting a good night’s rest was so important that it should be given the highest level of weight (three). Why is sleep so important to health? Sleep influences processes in the brain that allow it to remember and learn new information. It can also influence brain linkages that increase the ability to concentrate and feel positive emotions. People who get more rest have more energy for tackling difficult tasks. Getting enough sleep also helps to control weight by increasing the body’s ability to burn carbohydrates. On the other hand, having too little or poor quality sleep turns on hormones that affect appetite and promote carbohydrate storage that leads to weight gain. Sleep can also affect heart health: not getting enough sleep can increase the risk for heart disease by increasing high blood pressure, stress hormones and irregular heartbeats. Limit daytime naps to 30 minutes so you are tired at night. Exercise to increase your physical energy and allow your tired muscles to relax for a good night’s rest. Avoid watching TV in the bedroom, as the artificial light can disrupt sleep rhythms. Avoid eating foods that may disrupt your digestive system right before bedtime. Check out the Fitness Rankings to see how well people in your city are sleeping!